STUDY TOUR TO EUROPE/USA etc. IIPM’s global alliance is an offshoot of the institution’s belief in the power of collaboration. In the present business context, a truly global programme is the only way to afford budding business students the right exposure to prepare them for the global market and competition. As an institution, IIPM aspires to make available the best in class opportunity for every student. Through its extensiveglobal alliances, IIPM has made available an array of opportunities for its students to learn from the best in the world. Today the corporate world demands that a truly global exposure becomes a part of the pedagogy. There is only so much that can be fit into a curriculum and therefore, the way forward is to partner with international organizations and institutions to bring together a unique experience for all stakeholders – students, faculty and administration. IIPM has made available an array of opportunities for its students to learn from the best in the world. Today the corporate world demands that a truly global exposure becomes a part of the pedagogy. There is only so much that can be fit into a curriculum and therefore, the way forward is to partner with international organizations and institutions to bring together a unique experience for all stakeholders – students, faculty and administration. 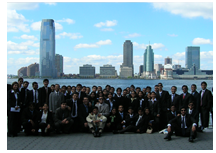 Under the aegis of the Global Opportunity and Threat Analysis (GOTA) program students from IIPM attend week long classes at some of the best business schools in the United States. IIPM has agreements with The Darden School of Business at the University of Virginia, the McCombs School of Business at the University of Texas at Austin and the Ivy League Cornell University. Senior Faculty from these institutions conduct a week long purpose designed course for IIPM students at their campus and award qualifying students a Certificate in Management. Alongside attending these intense classroom sessions, students also undertake visits to major corporations and institutions abroad and interact with senior management to have a firsthand knowledge of how businesses function across the globe. The definition of free study tour and boarding & lodging includes the cost of travel from the nearest international airport to the destination and back and cost of stay, study material, tuition fees and daily breakfast. Students have to bear the cost of visa, passport and rest of the meals. Students may note that the institute is not bound to take students to the GOTA programme trip during the duration of the stay at IIPM in case the foreign exchange purchase rates increase beyond ten percent of what the prevalent rate s were at the time of admission. The institute in such a case will be waiting for a maximum of 24 more months for the foreign exchange rates to be favourable. In the case the institute is unable to send students for GOTA programme even after the 24 months of the official completion of the programme date the institute will aid the student by proportionately reducing number of days for the GOTA programme trip after adjusting the foriegn exchange rates at the day of their joining viz-a-viz the rates on the day they are being sent within the period of an additional 6 months. Students may however opt out of the GOTA programme and adjust GOTA fees against various other offerings of the institute including re-examinartion fee, additional specialisation fee etc as per the institutes official conversion plan that is declared to all students for that particular academic year. Students may however note that under no circumstances the fees or any proportion of the fee will be refundable, students will necessarily have to choose between going for gota for reduced number of days or adjustment with other deliverables of the institution. Over the last six years 20,000 students have gone to various institutions and organizations in countries like USA, UK, Switzerland, Italy, Belgium, France, etc. When all students return after their visits to various countries, they are encouraged to share their experiences and the knowledge gained from the interactions through structured discussions with other students of the institute. This creates an intellectually stimulating and exciting environment in the campus and students get a first hand experience of how things work in other countries. Students are also required to submit projects on the areas of key learning. During the GOTA visits, IIPM has conducted seminars and lectures in association with organisations/institutions like: IMD, Lausanne ; The United Nations; International Labour Organisation; The World Bank; Nestle; Citigroup; Honda; Oxford University; IBM; WIPO; BMW; FIAT; Suzuki; Insead; IMI, Europe; Credit Suisse; Sulzer; World Trade Organisation; Omega etc. Kyoto University, Panasonic Centre, Hyogo Prefecture, Kobe, Suzuki Motor Corporation, Honda Co., International Christian Unversity, PASONA Inc. Seven Seas Group Of Companies, Abu Dhabi Commercial bank, IT People Consulting, GRP Industries Ltd. (Giant Group), National Bank of Fujairah, Emirates Bank, Carbonic International, ACER, Arabian Radio Network, SIYA Group of Companies..